Knowledge is one of the most powerful business tools there is. The things you know that others don’t are what keeps you ahead of your competition. However, this advantage only remains while no one else has the information. That is why sweeping for electronic bugs is so important to your business’ future. There is a range of information that your business has that is likely to be wanted by your competitors; a bug can be placed with the aim of taking away your advantage. While some of this is likely to be specific to your sector, there are elements that all businesses will have in common. One of your key assets is your employees. If you are able to employ and retain the best, then your business will flourish. Finding out what it is that keeps your employees loyal to your company would be an advantage to your competitors. A hidden bug, such as a surveillance camera, found during bug sweeping, placed in employee breakrooms or your HR department are likely to be looking for this type of information. Another key area is likely to be your financial management. How you look after the money that comes into your business really can give you an advantage over others. Everything from executive pay, to how you organise paying contractors, clients, staff and even your bills makes a difference. Using counter surveillance methods to find and remove these surveillance bugs quickly is essential to you retaining you advantage in these areas. Other information that competitors could be after ranges from your latest bids to information they could use against you. Even the smallest piece of information could make a huge difference. Keep your advantage by employing professionals to regularly undertake sweeping for electronic bugs in your offices. At Advanced Sweeping, we take all your security and privacy concerns seriously, and respond as soon as we can. 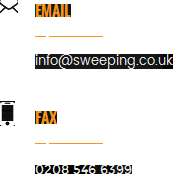 Visit http://sweeping.co.uk/ today to learn more.